Kim and Roy Fox’s 1915 stove, restored by Dave Erickson. Joan Kruse’s 1900 wood-burning stove. It is original to the house, and yes, they still use it! “Are vintage stoves practical?” Yes, there are practical benefits of using vintage stoves. Vintage stoves were built to last and have reliability that rivals most new appliances. Simple to operate, they also offer beautiful styling. While contemporary kitchens in old houses create a state of “cognitive dissonance” within the kitchen, a vintage stove will go a long way to capture a sense of style, interest, and charm in your kitchen. 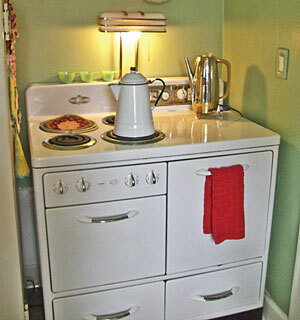 Vintage stoves are always immediate magnets of interest and conversation. “Will a vintage appliance have enough capacity?” In most cases, the answer is yes. While marketing and product promotion efforts have been successful at selling the public on the concept of commercial appliance within residential settings, the need for a culinary Hummer is more the exception than the rule. A vintage stove will usually handle the demands of a residential kitchen very well; most kitchens in old houses are oriented toward more modest family meals, and unless one is running a catering company from her home, the need for an industrial kitchen is a rarity. “Who will service vintage appliances, can parts be found, and are old appliances safe?” Yes, there are parts and services available should your vintage appliance need some medical attention. As with any appliance, old or new, safety relies on both proper maintenance and correct operation. Here in Portland there are several businesses that are great recourses for vintage stove owners including Appliance City at www.appliancecity.info, and Bee Jay’s Appliance at www.beejaysappliance.org. While it is true that vintage stoves can add just the right charm and be functional, vintage stoves are not right for everyone. If you have a modern house, need commercial size appliances, or want the latest conveniences, you may be better off with modern appliances. Luckily however, there are modern stoves that are made to look vintage for those who are not quite ready to venture into the realm of true vintage stoves (and other appliances). For those who are interested in these new appliances that have a retro look, there are businesses in that cater to those needs as well, such as Big Chill www.bigchillfridge.com, Elmira Stove Works www.elmirastoveworks.com, and Inglenook Energy Center www.inglenookenergy.com/Heartland_Appliances/heartland_appliances.htm. Not to leave out the Old House Geeks that really want to connect with others who love old appliances, Jack Santoro’s Old Appliance Club is a fabulous resource. His website can be found at www.antiquestoves.biz/toac/about.htm. Membership is worldwide, and Santoro brings both practical information and off beat humor together and provides a great way to network with other old appliance lovers of all kinds. So often the kitchen is the showpiece of the house, and if a vintage stove is what will bring that kitchen charm together, it’s worth taking into consideration that their beauty runs more than skin deep. There has not been one regret from any of my clients who have chosen what is often considered “functional art” appliances. Karla Pearlstein works as a preservation consultant. Through her business, Restoring History, she provides educational resources and consulting services focused on the preservation and restoration of historic buildings. Pearlstein can be contacted at 503-452-7772 or visit her website at www.restoringhistory.com. 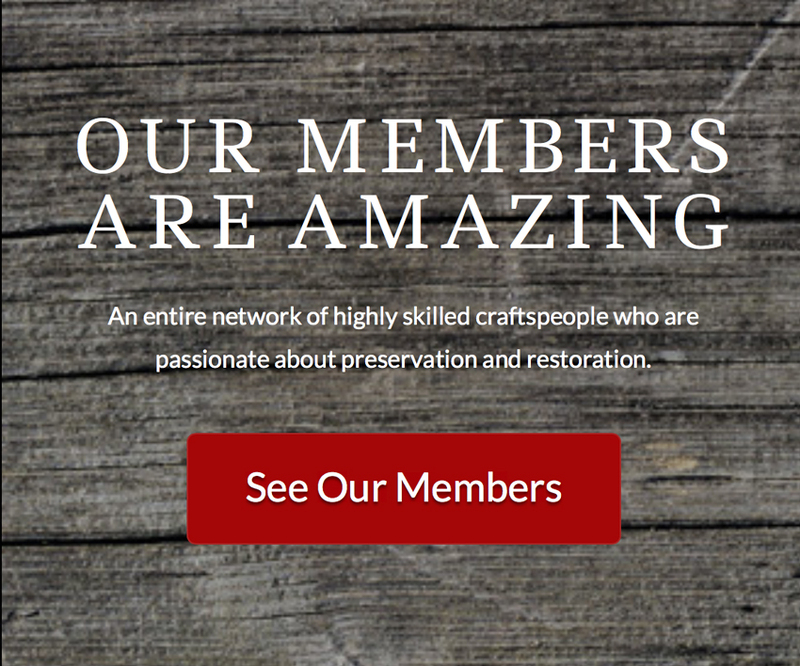 "The Preservation Artisans Guild Mission is to preserve our material culture through a community of artisans. We encourage best practices in traditional building crafts, interior design, architectural design, and the decorative and fine arts." Preservation Artisans Guild ("PAG") is a non-profit organization that encourages best practices in the preservation arts. The information contained on the PAG website, blog and social media sites is for information purposes only and PAG, its board members, and affiliates (collectively the "Organization") make no claims, promises, warranties or guarantees about the accuracy, completeness, or adequacy of the information contained therein or linked thereto. The Organization makes no representations, warranties or guaranties on behalf of its members and expressly disclaims all liability to any person who, upon reliance on the information provided on the PAG website, blog or social media sites, takes or fails to take any particular action. Your use of the PAG website, blog and social media sites indicates your agreement with, and consent to, these terms. © 2018 Preservation Artisans Guild.